Our re-fight of Albuera was much like the real thing. It was a great tussle, a near-run thing and a “damned nice thing” in my book—since the French won a minor victory! The outcome was determined according to the scenario rules. 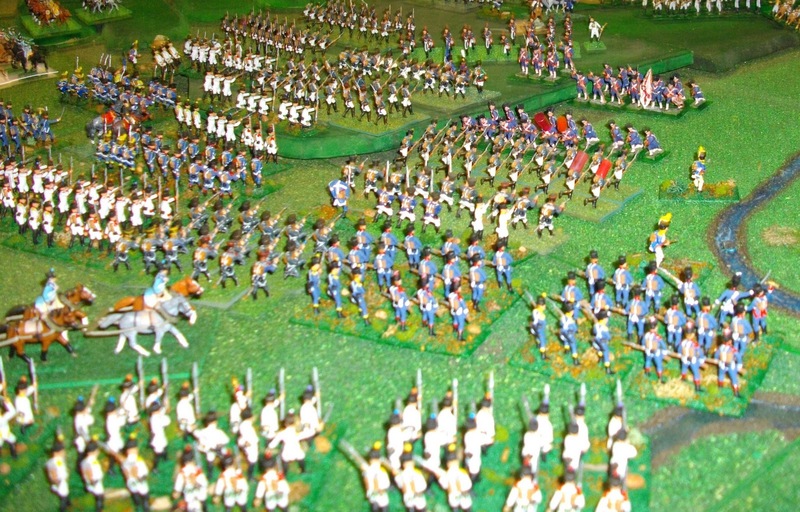 After the battle the French would have had to withdraw, as Soult did historically. 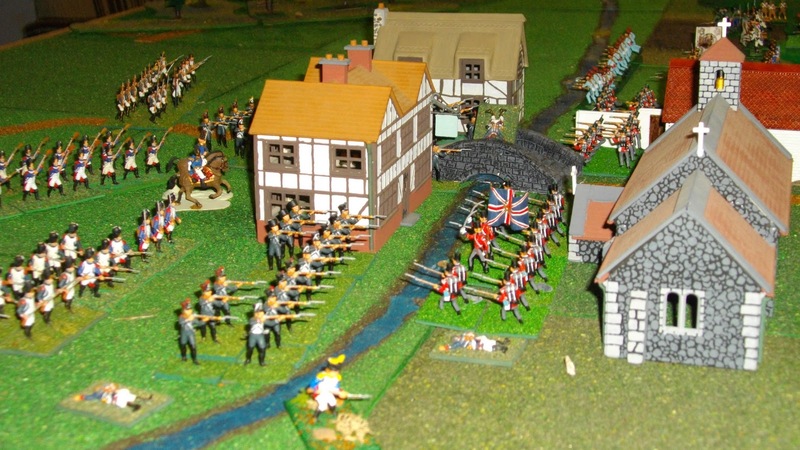 The French army was not able to damage the British as much as they did in the real battle, but did manage to break all of the Spanish troops plus the British cavalry. They even captured Albuera and held it for seven turns, with the Anglo-Portuguese re-capturing it on the second last turn! 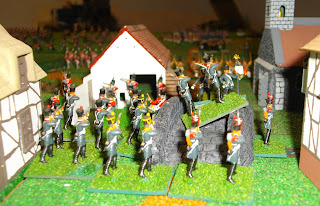 We based this game on the scenario in Fields of Glory. 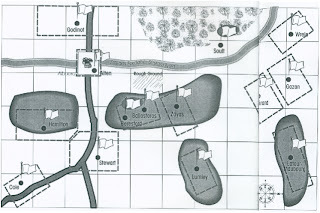 This scenario begins after Soult’s brilliant out-flanking manoeuvre and with only Zayas’ Spanish ‘division’ and Lumley’s cavalry turned to meet the new threat (map below). 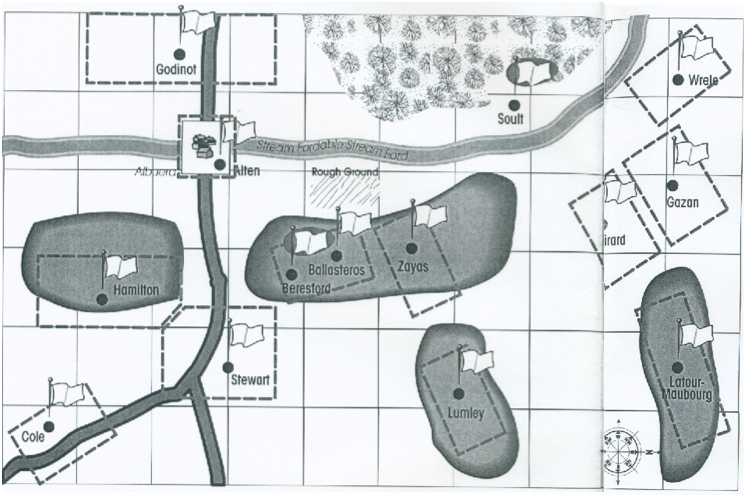 Above: schematic map of Albuera from the Fields of Glory scenarios for Shako rules. 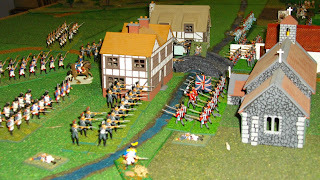 Below: a series of views of the wargames table. 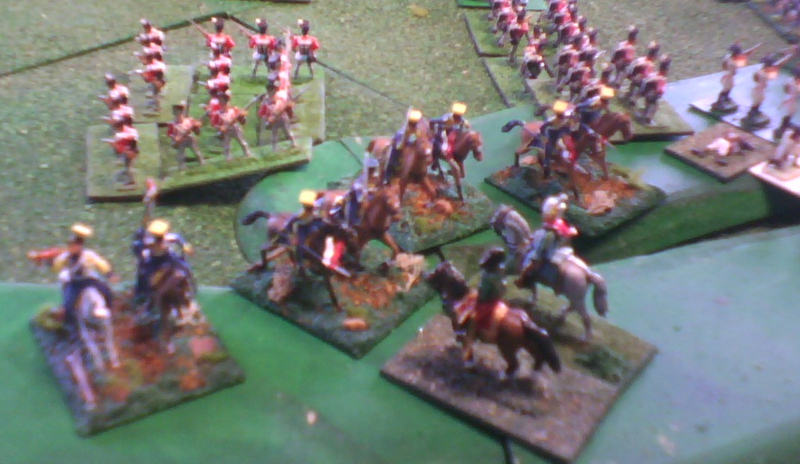 Firstly looking south towards Albuera; secondly Lumley’s cavalry on the Anglo-allied right; thirdly Latour-Maubourg’s cavalry on the left of the French attack and lastly Girard and Gazan’s infantry at the southern end of the tabletop. Initially we used this game as a play-test of the de Bonaparte à Napoleon (DBN) rules, but we only completed two and a half turns with them, finishing the game using Shako instead. It had been a little too ambitious to use DBN for Albuera. I had only newly finished my translation of the rules and so was the only one who had read them. This meant that we could only refer to them by using my hand-written notes or by me doing a translation on the fly. It also soon became evident that they are better suited to a smaller action or section of a larger action—fighting in buildings may be ideal. The battle opened with a large cavalry mêlée between Latour-Maubourg’s dragoons, hussars and chasseurs and the British dragoons/dragoon guards and light dragoons, supported by regiments of Portuguese cavalry, that had recently been placed under the command of Major General Lumley (photos 5 and 6 below). The British regiments came off the worst and broke at the end of second turn. However, Latour-Maubourg’s cavalry had also suffered during the extended mêlée and, following additional casualties from artillery, failed morale on turn 4 and retreated. They did not rally until turn 11; too late to have an further impact on proceedings. This left the unbrigaded Vistula legion lancers, understrength 27th chasseurs à cheval and a weak regiment of Spanish grenadiers à cheval as the only effective ‘French’ cavalry formations on the western side of the battlefield. Opposed to these were the Penne-Villemur's understrength regiments of Extremaduran hussars and Spanish dragoons from various regiments (photo 7). While these dramatic cavalry combats were taking place, Gazan’s and Girard’s divisions were attacking Zayas’ Spanish 'division' which occupied the Anglo-Allied right flank (photo 8). Meanwhile, Godinot’s diversionary attack on Albuera (photo 9) achieved unexpected results. The French drove von Alten’s KGL battalions from the town on turn 3 (photo 10). Cole gathered his Anglo-Portugese division and repeatedly attacked the town in an attempt to re-take it (photo 11). He was finally successful on turn 11 (photo 12). The survivors of Godinot’s troops broke on turn 12. Fortunes continued to ebb and flow in the main, southern sector of the battlefield. Just as one side seemed to gain the upper hand, another result would switch momentum to their opponents. After initially being successful against the Spanish dragoons, the un-brigaded French cavalry failed it’s ‘divisional’ morale on turn 4 and retreated to the rear of the French lines. Rain began to fall at the end of turn 5, reducing the effectiveness of small arms and artillery fire, but the desperate infantry combat continued. As in the real battle, Zayas’ Spanish troops resisted doggedly, but the overwhelming numbers of French began to tell on these gallant men (photo 13). 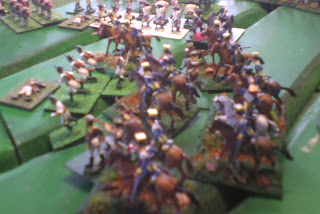 Photo 13: Under sustained attack, Zayas’ ‘Army of Extremadura’ begins to crumble. Around this time the unbrigaded ‘French’ cavalry rallied and re-entered the battle. As if controlled by the ghosts of their historical counterparts, the Vistula legion lancers, “Los Diablos Polacos”, charged and broke the square of the Voluntarious de Navarre (photo 14). This in tun broke the will of the ‘Army of Extremadura' which retreated from the battlefield. The lancers carried on to attack the 2/48th British Line managed to form a hasty square. The lancers fell upon them, but suffered terrible losses and broke, taking with them the remainder of the unbrigaded cavalry (photo 15). Photos 14 and 15: “Los Diablos Polacos”. The rain storm ceased at the end of turn 10. This produced an immediate effect on the cannon fire, with the guns of both sides producing devastating results on turn 11. On the French side, the casualties from this artillery fire were enough to break the will of Girard’s division which retreated from the battlefield leaving a huge gap in the right centre of the French line. 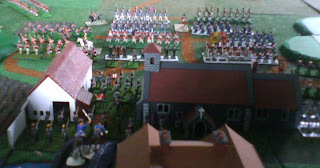 The game ended after turn 12 and was declared a minor French victory under the scenario rules. 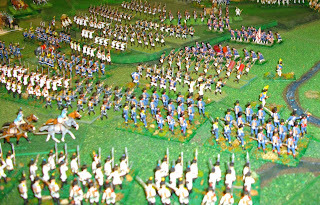 It was a pyrrhic victory though as, like the real battle, the French would have withdrawn in the days following the battle. Very interesting battle and batrep! I'll come back!